Stud earrings stun in rose quartz - Susan Said... WHAT?! Personal style is, well… personal. And, my daughter has a very strong sense of what she does, and doesn’t, like. Small, discreet stud earrings are one of the hallmarks of her personal style. 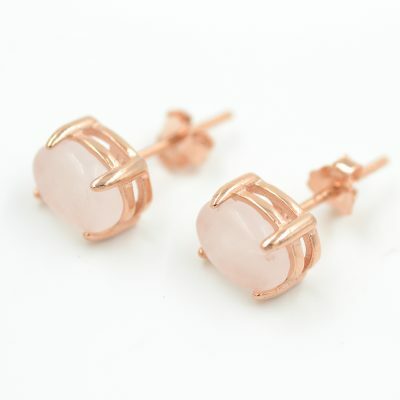 So, when I saw these simple rose quartz stud earrings by espere, I knew she would absolutely love them. The rose quartz is a lovely shade of beige-y pink and a wonderful neutral to coordinate with almost any ensemble. Dressed up or dressed down, these earrings are so pretty! And, the warm, rose gold setting is the perfect complement to the stones. Not only are these earrings beautiful, they are also made to last. The stones are genuine polished rose quartz, not plastic imitations. And, the settings are hypoallergenic sterling silver plated with rose gold, which resist both color fading and tarnishing. My daughter also thinks these oval earrings are the perfect size. They measure 0.38” in width, by 1.38” in length, by 0.38” in height. So, they sit squarely on the ear for a single piercing, but are small enough to use for double or even triple ear piercings. These stud earrings are also beautifully priced! They retail for $25.99 on Amazon Prime. So, they would make a much-appreciated gift that won’t break the bank. These earrings are even backed by a 30-day money back, 100% satisfaction guarantee from espere. In addition to these lovely earrings, espere also offers a huge range of jewelry options at equally affordable prices. Other elegant pieces I know my daughter will love include a simple pearl solitaire necklace ($16.99), a sterling silver stackable ring with tiny clear CZs ($15.99) and sterling silver stud earrings adorned with sparkling blue CZs. To see the entire line, visit espere. PHOTOS: Image used with permission by espere. DISCLAIMER: No financial compensation was received in exchange for this post. I did, however, receive a promotional sample of the rose quartz stud earrings from espere in order to fully evaluate the product. Regardless, I only recommend products or services I believe will be good for my readers.